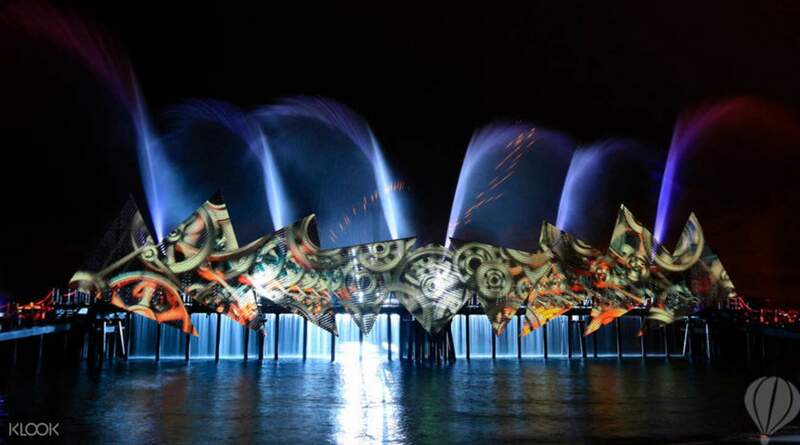 Experience 3D projection mapping, state-of-the-art lasers, spectacular pyrotechnics, fountains and water jets, and an enthralling music production – all in one incredible fusion! Enjoy the show with a value snack combo or get a discounted gelato at Beach Station for more evening delights! -Must visit in Singapore!!!!!!!!!!!! -My family and me enjoyed this show much because the performance was very perfect with firework. Complete this Klook activity to get 10% of the activity cost back in free credits to use on your next booking. For example, book US$9.59 to get US$1.0 free credits. 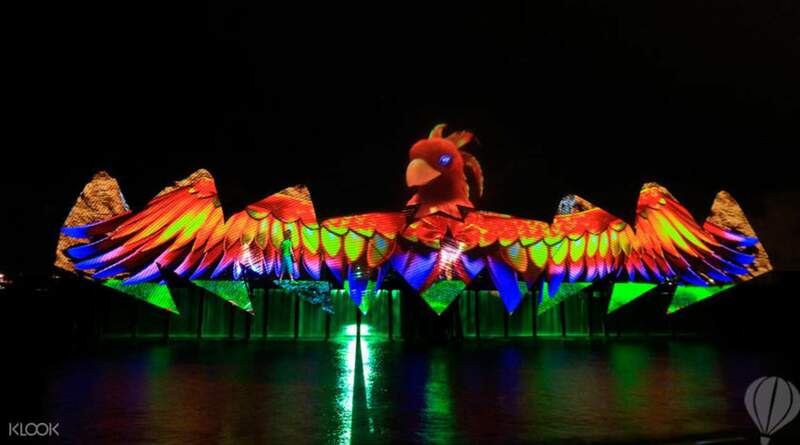 In the world's first permanent night show set in the open sea, Wings of Time features an epic production that brings together 3D projection mapping, state-of-the-art laser lights, robotic water fountains and pyrotechnics to tell the tale of Shahbaz and friends. The story follows the mythical birdlike creature and his two human pals as they journey across breathtaking landscapes through time. 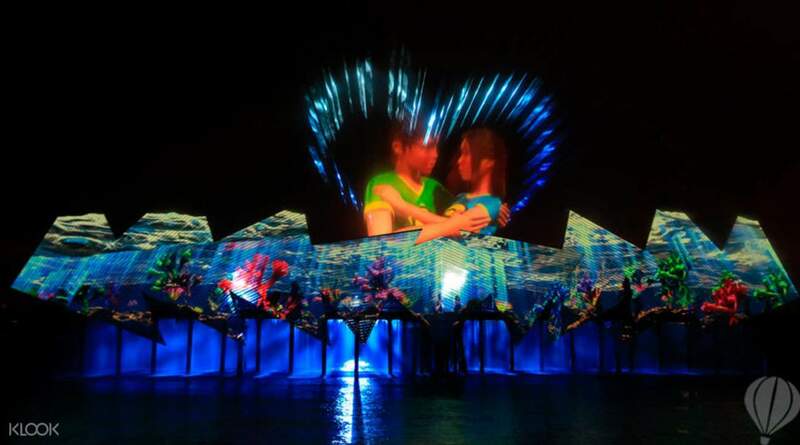 The imagery is projected onto a massive water screen, offering a captivating visual feast, while music has been produced to sweep you off into the narrative from the get-go. 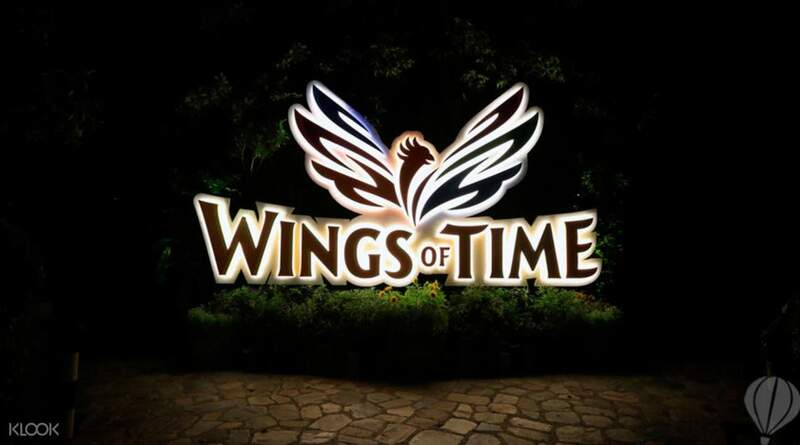 A magical experience for both children and grown-ups, weaved into a tale of friendship and courage and awe, Wings of Time is a must-see while in Sentosa! Such an amazing experience! The show was definitely better than expected & my kids were mesmerized the whole time. We considered purchasing premium seats through another site, but honestly we didn’t need it. We arrived early (which they have you do anyway when redeeming the tickets), and we got great seats...so the only real difference is that premium seats have a back to them as opposed to just sitting on a bench. Highly recommend purchasing regular seats through Klook! Such an amazing experience! The show was definitely better than expected & my kids were mesmerized the whole time. We considered purchasing premium seats through another site, but honestly we didn’t need it. We arrived early (which they have you do anyway when redeeming the tickets), and we got great seats...so the only real difference is that premium seats have a back to them as opposed to just sitting on a bench. Highly recommend purchasing regular seats through Klook! Truly a spectacular extravaganza.The light and soune effects were totally mesmerising.I think one of the places where Sentosa scores big is by giving their activities good publicity and then making it very convenient.The tickets were booked on Klook and exchanged across the Kiosk at the Ticketing Counter.There is not much difference between a Standard and the more expensive one as its a big open space on the sea front where there is enough and more seating. The storyline was simple and added a zing to the special effects being shown.The Wings of time is strongly recommended especially for the firrworks at the end of it.Thanks Klook yet again. Truly a spectacular extravaganza.The light and soune effects were totally mesmerising.I think one of the places where Sentosa scores big is by giving their activities good publicity and then making it very convenient.The tickets were booked on Klook and exchanged across the Kiosk at the Ticketing Counter.There is not much difference between a Standard and the more expensive one as its a big open space on the sea front where there is enough and more seating. The storyline was simple and added a zing to the special effects being shown.The Wings of time is strongly recommended especially for the firrworks at the end of it.Thanks Klook yet again. Great show! A combination of water, fire, fireworks, lasers, lights and a little live action. Don't miss it! There are two shows everyday. The show lasts for about 20 mins. It has ample of space to accommodate lots of people, but try getting in early to get the center seats. I suggest to take the first show as the queue tends to get longer on the second show bec people have to wait for the first show to finish. Great show! A combination of water, fire, fireworks, lasers, lights and a little live action. Don't miss it! There are two shows everyday. The show lasts for about 20 mins. It has ample of space to accommodate lots of people, but try getting in early to get the center seats. I suggest to take the first show as the queue tends to get longer on the second show bec people have to wait for the first show to finish. I was in awe after watching this show. Like wow! I think this is probably one of the best thing we’ve experienced so far in Singapore. Its definitely worth it! I would probably recommend this on first time goers in Sentosa. This show will probably gonna blow your mind. I want to watch it again. Thank you klook for making this possible. Me and My family enjoyed every single part of this show. I was in awe after watching this show. Like wow! I think this is probably one of the best thing we’ve experienced so far in Singapore. Its definitely worth it! I would probably recommend this on first time goers in Sentosa. This show will probably gonna blow your mind. I want to watch it again. Thank you klook for making this possible. Me and My family enjoyed every single part of this show. This light show is not just a light show. It actually has a story. Sitting at the beachfront while watching a light show with some mist from the sea, I would say this was a unique experience. We even got free popcorns and some items for free! I hope it will be a good weather when you watch this because it is an open space. This light show is not just a light show. It actually has a story. Sitting at the beachfront while watching a light show with some mist from the sea, I would say this was a unique experience. We even got free popcorns and some items for free! I hope it will be a good weather when you watch this because it is an open space. Fantastic! A very cool show which made me think about the technology, engineering and art throughout. Booked tickets through Klook with discounted price. Tickets to be claimed at the counter before entry. Fantastic! A very cool show which made me think about the technology, engineering and art throughout. Booked tickets through Klook with discounted price. Tickets to be claimed at the counter before entry. It was one of the most amazing shows which I have ever watched in my life. One must experience this show. Different time eras were beautifully showcased by means of laser, water spray screen and sound. The actors were also excellent in their job and hats off to the commendable effort put in by the technical team. I was fully mesmerised and absorbed throughout the show. I will definitely recommend this to anyone visiting Singapore. It's a lifetime memorable show which will be enjoyed by kids and adults both. It was one of the most amazing shows which I have ever watched in my life. One must experience this show. 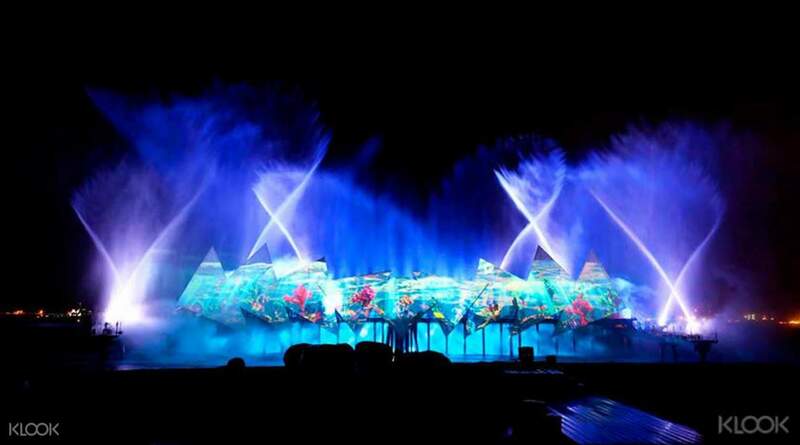 Different time eras were beautifully showcased by means of laser, water spray screen and sound. The actors were also excellent in their job and hats off to the commendable effort put in by the technical team. I was fully mesmerised and absorbed throughout the show. I will definitely recommend this to anyone visiting Singapore. It's a lifetime memorable show which will be enjoyed by kids and adults both. Q: Do I need to buy tickets for my children? A: Children aged 0-3 are free. Otherwise, they will need to purchase tickets, which is the same price as adult tickets.